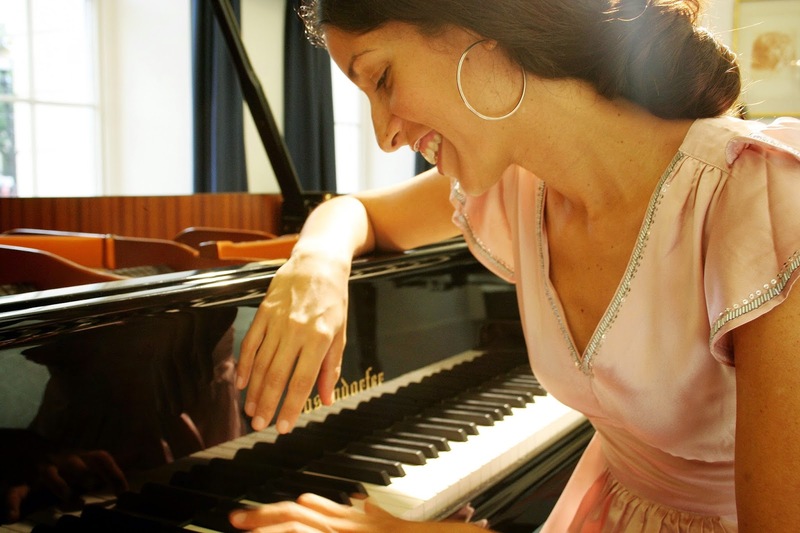 MOBO award-winning pianist Zoe Rahman talks to Kathryn Shackleton about the women who have influenced her musical career. LondonJazz News: What’s your experience of being a woman in the male-dominated world of jazz? Zoe Rahman: When I started out I just loved the music and I wanted to play, and all my early teachers happened to be women. My primary school teacher had a big influence on me. She was really enthusiastic and got me into music, and then my first piano teacher was female too. I was taught by a woman on the Royal Academy classical course, and then I went to Berklee in America to study with Joanne Brackeen. Being a woman was never an issue early on. The more I play, the more I see how women musicians are described in the media, the more I see that it is an issue that women have been written out of jazz history for many reasons. Obviously as a performer and composer I’ve noticed that the image of women in jazz traditionally is that you are a singer. So in terms of marketing, record companies and the press are used to presenting women as singers and for a female instrumentalist it’s very hard to be seen by record companies as someone who can make money. Nina Simone, for example, was an amazing piano player, but she couldn’t get anywhere with that as a woman at the time. There are many women in jazz who have been told – including me – ‘why don’t you become a singer, you could make a lot of money?’ For me, it’s not about that. I want to play the piano. Jazz is a very hard art form for anyone to be involved in, male or female. Getting gigs, practising, learning the music - it’s hard graft and women have that extra challenge of not necessarily being recognised. LJN: Are there some advantages of being a woman in jazz? ZR: No, I’m not sure there are any advantages! Actually, it’s something different for audiences, though. I do notice that at my gigs a whole mix of people, especially women, come up to me and say it’s really nice to see a woman leading a band so it’s an advantage in that it encourages other people who wouldn’t normally come to a jazz gig to come and hear the music, and hopefully that leads them to listen to other jazz too. LJN: You recently became a mother – how has that affected your music and the way you work? ZR: It’s amazing being a mother! It’s the best thing in the world, and my son is a year old now. Early on I took him with me on quite a few gigs. It gives you a whole different perspective on life and on your music, and it’s very difficult to find the time to be near your instrument and to practise. It’s helped me in a way, though, because the limited time you do get to practise or perform you’re really focused on what you’re doing in a very different way because you know that’s the only time you have. I’m still working with my trio, though, and I’m excited to be starting a duo tour this year with Courtney Pine. LJN: Which women have influenced you in your musical career? ZR: Joanne Brackeen has been a massive influence. Julian Joseph introduced me to her. I was at college and doing a dissertation on Bill Evans and I really wanted his view on Bill, so I went up to him at one of his gigs and I asked if I could play him some of my tunes. We met, I played my music to him and he recommended Joanne’s album Special Identity, which I’d never heard of. Julian made me a recording of Joanne’s music, because he heard in my music something of hers. Then I went to Berklee on a summer school, and Joanne Brackeen just happened to be teaching piano there and I thought – this is my dream! So I had piano lessons with her and the character of her music has had a big influence on my playing. Her sound at the piano is amazing and, like Ellington, she uses the whole range of the piano. While I was on the summer school I thought I might as well apply for one of their scholarships, never thinking that I would get in, but Joanne popped her head in during my audition and said ‘you’ve got to let her in!’. She felt my time-feel was very strong, and I thought that if she believed in me I must be OK.
Also Alice Coltrane has been important to me. Her sound is very different from other people. I remember before I made my second album, Melting Pot, I was listening to a lot of Alice Coltrane and Joanne Brackeen and trying to get some of their energy and their sound into my playing. My own mother was a big influence too. She was a doctor and she grew up in New Zealand where there were 50% women and 50% men at her medical school. She came to the UK and found that the balance here was more like 90% men and 10% women, and she was shocked! She sees in my career the same challenges as she had. Nikki Yeoh was also really important to me. She was gigging around the time when I came to London, she was a strong leader, she had great communication with her band and the audience, her playing was individual and she was a very creative person. She was also part-Asian, so I really identified with that. LJN: How do you think more girls can be encouraged to get into jazz? ZR: I’ve met quite a few girls in my teaching who are gifted musically, and who may have heard music at home or in a choir or at church but don’t have much direction. I often make them CDs of a variety of music that might inspire them. Julian Joseph really helped me early on by giving me a whole list of albums to listen to, so I try to pass that on. I also give youngsters free tickets to my gigs because that’s a really important aspect of the music. Live gigs are where jazz really exists. I encourage girls to start coming to gigs young so that it becomes a lifelong passion. Even if they are not going to be performers they are an audience for jazz, or might want to get into the sound world as engineers or to be promoters, for example. There is a much broader aspect to the music industry that women can get involved in. It’s very male-dominant at the moment but that is beginning to change. LJN: How are you celebrating International Women’s Day? ZR: I’m playing a gig with Amanda Drummond who’s an incredible viola player. We’ll be playing some music by Jessica Williams, Joanne Brackeen and other female composers, plus I’m going out to Norway to work with some female students to celebrate International Women’s Day. This came about through Tomorrow’s Warriors and my work with their all-female band called Nérija. I’m also playing in the Steinway Festival for the first time, with a classical pianist called GéNIA who invited me to play with her, and Alcyona Mick will be playing with us too. They are all great female performers and I love working with them. Zoe will perform a solo set as part of an evening celebrating International Women’s Day, where she will be joined by guest artist Amanda Drummond on viola.